Today's outfit is very private school uniform - which I love. Odd I know. But I love school uniforms! Growing up I also looked forward to wearing my "school uniform" clothing. No, we didn't have a uniform for school (home-schooled K-12). We just bought the school uniform jumpers, skirts, blouses, cardigans each fall for our everyday/Sunday wear. I LOVED it! =) Anyone else love school uniforms? Another way you could look at my outfit, is that it looks late 1950s/ early 60s college girl inspired. Any of you own Sears Everyday Fashions: 1950s ? Near the end of the book you will find outfits just like this one. Oh, how fun! =) love it!! I love plad too!! I also LOVE the key watch necklace! Very pretty!! I love your skirt! 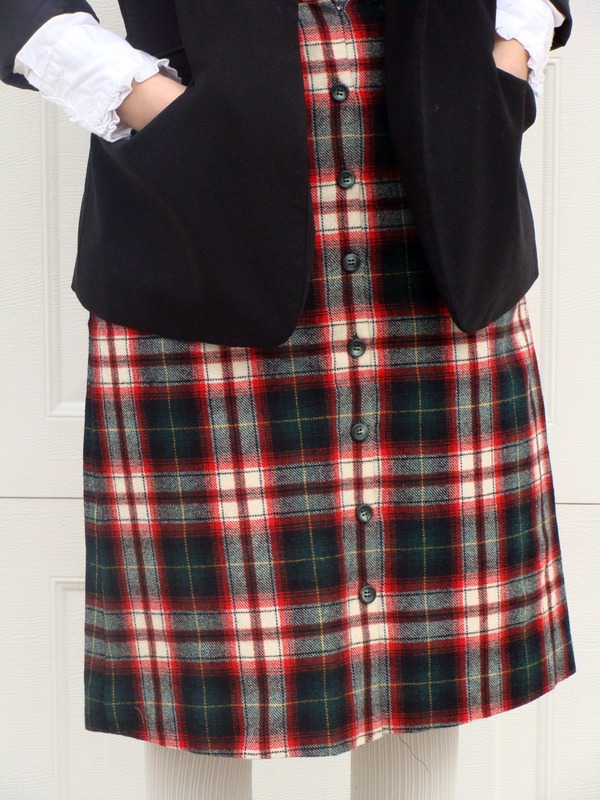 I have two plaid skirts I wear a lot this time of year, they're so fun! 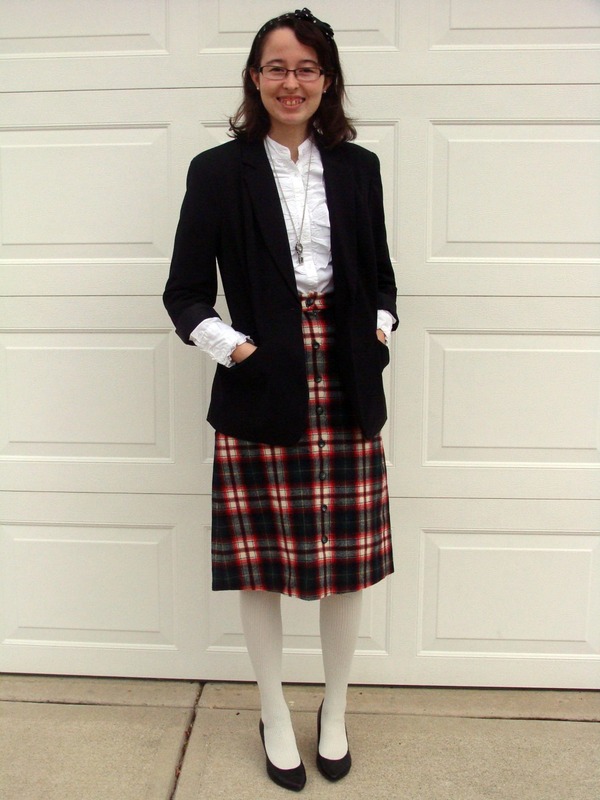 Just as Caroline said I have two wool plaid skirts I wear often this time of year. I posted pictures of one on my blog recently. I will have to wear mine tomorrow. Pictures of my outfit for today coming soon. I love yours! I hated my school uniform, but this is beautiful. They were ugly when I was in private school. I love plaid too! Thanks for sharing! I was wondering... do you find it difficult to wear heels all day? I love the way they look, but I think it would be impossible for me due to the amount of stair-running and running around in general that I do. When I got a pair of heeled boots, the first thing I did was fall down the stairs. Anna - At first I did. My ankles would keep twisting and I couldn't walk straight. But knowing that ladies wore heels all the time from the Renaissance to about the 70s/80s. That I could do it too. :) Now, I have no problems wearing heels. Just keep trying. As now I can run like normal in my heels. I love this outfit!!!!!!!! it is really gorgeous. Seriously sincerely!! !